Hack and Slash game genre was invented with aperance of diablo 1. Revolutionary Isometric view, great item and potion handling, great atmosphere, claustofobic dungeons, loads of enemies... This game had it all. 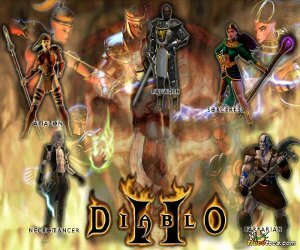 Then came its sucessor Diablo 2 and complementing Expansion pack, it was brilliant. It simply was! Created by Blizzard North and released by Blizzard Entertainment it upgraded graphic engine keeping same gameplay and was huge sucess. Set in the fictional Kingdom of Khanduras, located in the world of Sanctuary, Diablo has the player take control of a lone hero battling to rid the world of Diablo, the Lord of Terror. Beneath the town of Tristram, the player journeys through sixteen dungeon levels, ultimately entering Hell itself in order to face Diablo. Synopsis in short doesnt do it justice. Hordes of enemies, items, great fights and even greature treasures are not mentioned in it. It was truly great, feeling when you shut your lights send everyone out of room and started playing with your character even without internet connection. It was even better taking your character to lan party and doing some group hacking and slashing but it wasnt necessary. Single player was quite enough. Why do i mention this internet connection? Offcourse answer lies in newest addition to diablo familly, Diablo 3. Released on may in 2012. Diablo 3 has state of the art DRM (digital rights managemetnt) system in place. State of the art system that keep most of legal customers out of legal servers for first few weeks! Not only was that situation unresolved, but along came more problems including poor security, bugy gameplay and other signs of unfinished product. But biggest problem of them all is that DRM devil that keeps geting people strandled outside game. Even if you only want to play game you bought on computer you own you cant. You have to always be connected even in singleplayer. Great idea indeed. So if you actually want to play some diablo i suggest get yourself some good old Diablo 2 Lord of Destruction combo and enjoy. anonymous: "Diablo 2 Lord Of Destruction for Android with multiplayer would be huge success." Solve this complex math: 5 + 9 = ?